Failing re-election in 1840, Martin Van Buren returned to his recently purchased estate only two miles from the small New York village of Kinderhook where he was born and raised. He immediately began planning his return to the White House in the 1844 presidential election; however, Van Buren, the eighth president of the United States, was not elected to a second term. Not until after the election of 1848 did the ex-president come back to his home in Kinderhook to the life of a gentleman farmer. Van Buren treasured his estate, Lindenwald, residing there for 21 years. In his own words, this is where he spent "the last and happiest years of my life, a farmer in my native town." Martin Van Buren acquired the house and 137 acres of land in 1839. He immediately began improvements to the estate and continued acquiring property until, after six years, he held a total of nearly 225 acres. Van Buren operated a successful 191-acre farm on the 225-acre estate and experimented with cultivating new varieties of vegetables. He also undertook improvements to the house. Built in 1797, the original dwelling was a two and one-half story red brick Georgian-style house. 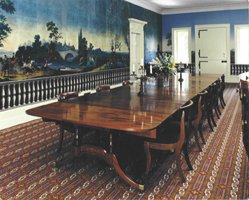 He removed the stairway and hung fashionable French scenic wallpaper in the center hall, which could then be used for banquets and balls. In 1849, Van Buren’s son Smith, who came to help his father manage the property, hired famed American architect, Richard Upjohn, to renovate the house. The renovations added more modern amenities--kitchen ranges, running water, a bathroom, and a furnace that was one of the first central heating systems in the Hudson Valley. Exterior renovations included the addition of a four-story brick tower, a central gable, attic dormers, and a new front porch and painting the whole house yellow. They transformed Lindenwald from an 18th-century Georgian house into a fashionable Italian villa, a popular trend of the mid-19th century. At the time of Van Buren’s inauguration, the country seemed prosperous, but less than three months later the panic of 1837 began. Hundreds of banks and businesses failed. Thousands lost their lands. For six years, the United States struggled with the worst depression thus far in its history. Van Buren's continuance of Jackson's deflationary policies only deepened and prolonged the depression. The remedy he proposed was an independent Federal Government treasury system, which Congress refused to authorize until 1840. The delay helped cement Van Buren’s defeat in his run for re-election. His opposition to the annexation of Texas further hurt his popularity in the West and South. Van Buren blocked the annexation because of the certainty that it would add to the slave territories and carried the threat of war with Mexico. Far from resolved, the issue would cause war and domestic turmoil over the next several decades. In 1844, Van Buren failed in a bid for the Democratic presidential nomination, and he ran unsuccessfully on the Free Soil (anti-slavery) ticket for presidential reelection in 1848. Increasingly opposed to slavery, Van Buren endorsed Lincoln's efforts to limit slavery and preserve the Union. Van Buren lived out the remainder of his life at Lindenwald until his death in 1862. The house at Martin Van Buren National Historic Site has been restored to its appearance during Van Buren’s occupancy. 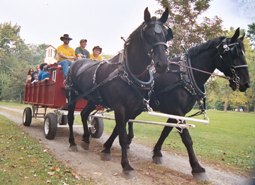 The grounds include 12.8 acres of the 225-acre farm that Martin Van Buren presided over in 1845. 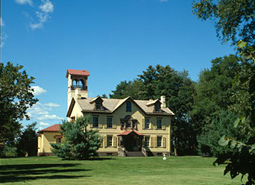 Martin Van Buren National Historic Site, a unit of the National Park System, is located in the Town of Kinderhook, NY on State route 9H. Click here for the National Register of Historic Places file: text and photos. President Van Buren's mansion is open daily for tours from mid-May through October. For more information, visit the National Park Service Martin Van Buren National Historic Site website or call 518-758-9689. Tours begin on the hour from 9:00am to 4:00pm. An entrance fee is charged for those 16 and older. There is no charge to walk the grounds, which are open year round from 7:00am to sunset. The Martin Van Buren National Historic Site is the subject of an online lesson plan, Martin Van Buren’s “Return to the Soil". The lesson plan has been produced by the National Park Service’s Teaching with Historic Places program, which offers a series of online classroom-ready lesson plans on registered historic places. To learn more, visit the Teaching with Historic Places home page. Lindenwald has been documented by the National Park Service’s Historic American Buildings Survey.